Metro Chrysler Dodge Jeep RAM | Chicopee, MA. | Make It Metro! At Metro Chrysler Dodge Jeep RAM, our focus is on the customer. Whether you're shopping for a new or used Chrysler, Jeep, Dodge or RAM or you're looking for quality car service and parts, we'll work hard to make sure your experience is a good one. We have a huge lot with room for a variety of models in the most popular colors and trims, and our dealership is one of the most accommodating places you'll find. With four brands in one showroom, it's easy to find the right model for your needs, whether your life calls for a hard-working truck, an SUV that can carry the whole family, or a stylish sedan that provides a comfortable commute. Take a look at our selection of new Chrysler, Jeep, RAM and Dodge models, as well as our budget-friendly used vehicles. We even have an auto financing team on location who can write you an affordable car loan or the lease you need to make your new car work for all aspects of your life. Our Massachusetts Chrysler dealership won't let you just drive off into the sunset, either. Return anytime for top-notch Jeep, Chrysler, Dodge and RAM service and maintenance. You'll enjoy our large, comfortable customer lounge while we get to work on your vehicle right away. We're also here to support motorists who like to turn their own wrenches, offering an impressive inventory of OEM parts. 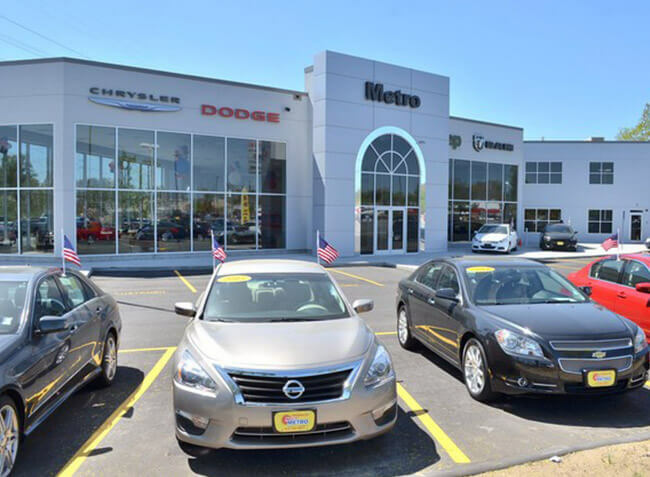 Whether you're from East Longmeadow, Northampton, Agawam, Holyoke, West Springfield, Easthampton, Longmeadow, Westfield, Enfield, Springfield or right here in Chicopee, MA, you'll love the selection and the service at our dealership. If you're searching for a new or used Chrysler, Dodge, Jeep or RAM, Make It Metro! We're a Proud Member of the Bertera Auto Dealership Family! Great service and friendly staff!!! Highly recommended for any needs!!! Mike in the service department is just the BEST. What a great guy. One of the best dealers around. Great prices. Sales and service excellent. When in expecting to buy an used car, with wants and needs for my new vehicle and got out with a brand new car and much more!! Will recommend Metro Jeep and our sales guy Steve Wilk! !